Joe Holiday, an ex Metro cop, finds himself dragged into an investigation by Mia, an IHOP waitress. The probing they do into the murder of Mia’s sister years earlier turns into a deadly manhunt with Joe and Mia suddenly becoming the targets of a vicious plot. I recently read “Clearwater Journals” by author Al Rennie. 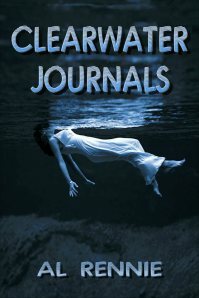 Having recently made my books available on Smashwords.com, I searched around the site and read brief summaries of countless books by independent authors before stumbling upon “Clearwater Journals.” I downloaded the book and read it within a couple of days. It was one of those books that you just seem to have a hard time putting down once you start reading it. Al Rennie does a great job developing the main character, Joe Holiday, and creating a bond between the character and the reader, something familiar that the reader can identify with. He did just as splendid a job with the character Mia, a young woman with a troubled past and not so clean a resume, shall we say. The story is fast paced and exciting and will keep you turning the pages. I’d like to thank Al Rennie for providing a quick Q&A about his work and about “Clearwater Journals,” the first book made available online. How long have you been writing and what inspired you to write? Rennie: I believe that I have had the bug to write since I was a teenager. I wrote poetry – mostly not that great – throughout high school and university. When I started working as a teacher and raising our family with my wife, writing fell by the wayside and other interests developed – although my appetite for reading took off. It wasn’t until I had a major motor cycle accident, that I started to write with the intention of getting published in the traditional sense – agent, editor and publish. I came close with a few forgettable adventures along the way. If you are a writer, you cannot explain it – you just have to do it – even when you want to quit. Where did you get the idea for Clearwater Journals? Rennie: I have been to Clearwater a number of times – the first visit when I was eight and went with my parents – and I still try to get there every year. My first four novels included the thinly disguised Lakefield and Peterborough part of Ontario. I couldn’t attract a publisher with them, and I wanted to break away from the Al and Norm story to try something else just for a new challenge. I knew Clearwater, so it seemed a natural choice. Writing in the form of a diary or journal imposed a chronology and then the characters took over to tell the story. Joe “Doc” Holiday is a great character with a sense of humor and the wits to match. He relates well to the readers. Where did you get the idea for developing him? Rennie: My wife says that Joe is me – and gets jealous of Mia because of it. In fact, Joe just happened. He is my personal composite of all the protagonists I have enjoyed in my reading. Telling a story in the first person allows the writer to be a bit more intimate and for that reason maybe more believable. You can identify more easily with him. There is a vulnerabilty about Doc that appeals, but his disdain for authority and traditional behaviour is attractive to everyone who has a bit of the rebel in him or her. So far you have self-published six novels. What are you working on now and what can we expect in the future from Al Rennie? Rennie: Clearwater Ambush should be available on Smashwords in about two or three weeks. The novel will then get to Kobo, Kindle, I-readers, Sony etc in ten days to two weeks after that. I have fifty or sixty pages of a manuscript currently entitled – The Crazy Little Girl that I may go on with, but Doc keeps telling me that he is not over yet. I guess we’ll see! Outside of your books, do you have a favorite book or author? Rennie: I have a number of authors I really enjoy, but my favorite is Elmore Leonard – even though I regularly break his nine rules of writing. I have a warm spot for the books written by Robert Crais, Michael Connelly and Carl Hiiasen. Where can we find your books and keep up with the latest news? Rennie: I have a Website that I try to maintain. The books are all released through Smashwords to the various reading devices – or from Smashwords directly. Just yesterday, I was contacted by a publisher in Turkey who wants the rights to print Clearwater Journals. If you can read Turkish, you can buy a print copy of Journals in about a year and a half – or so he has told me. There may also be an English print copy available through a subsiduary of the Turkish publisher called DreamBooks. You can get more information about Al Rennie at http://www.alrennie.com/.